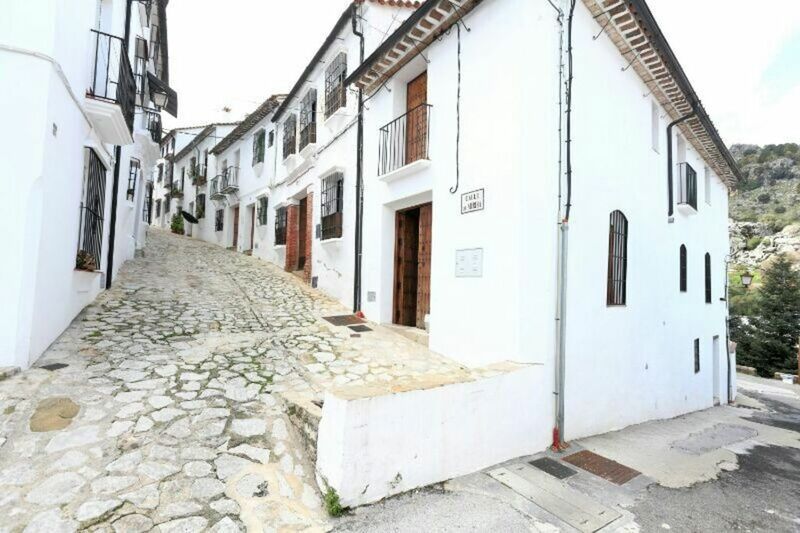 Mountain house in the town of Grazalema recently renovated in its entirety and furnished with all the necessary equipment for a faci ly stay of two floors with a total of three bedrooms, two bathrooms (one per floor), full kitchen and two salons (one per floor). It is equipped with black heat and also fireplace, which makes your stay comfortable in the cold season. It has a small garden patio with typical pile of the area with continuous water circuit. The views from windows and balconies are spectacular, perhaps the best of the village of Grazalema. The area in which the house is located is of absolute tranquility and only the song of the roosters in the morning, will reach your ears, like an absolutely natural alarm clock. endowed with natural light as they have exterior windows. Everything was here for a comfortable stay. Only one thing missing for English people, a kettle! This was our second stay in Grazalema.The house is great,traditional but with all mod.cons.We had some difficulty contacting the lady who had the keys to the house(luckily the Tourist office was open and they helped .The house would benefit from an information pack( places to eat,nearest Hospital,what to do when the electric goes off etc) and also an electric kettle.Overall we loved our stay at this house,we would recommend it,lovely places to visit nearby. Schönes Haus in guter Lage, im Stadtkern gelegen. Das Haus war bei der Ankunft eiskalt, wir waren wohl seit langem die ersten Mieter ( Ende März, war draußen kalt). Aber die Heizkörper schafften es, nach und nach eine angenehme Temperatur zu schaffen. Die Zimmer sind zweckmäßig eingerichtet. Ein Manko für uns: in der Küche gab es alles nur 6 Mal - bei 6 Personen Belegung musste man dauernd spülen, denn die Spülmaschine wurde nie voll. Teekocher wäre schön. Großes Plus: der Besitzer und die Verwalterin vor Ort sind sehr hilfsbereit gewesen. Schön restauriertes Haus, das am Rande des Ortes liegt. Die Ausstattung ist gut, alles funktionsfähig. Der Charme des Hauses macht es schwer, überhaupt fort zu gehen. Durch die Lage fühlt man sich auch als Tourist gleich als Teil der einheimischen Bevölkerung. Wir wollen gerne wieder kommen. Una casa muy acogedora, limpia y reformada con muy buen gusto, fuimos seis personas y la estancia fue perfecta. House recently restored according to the models of the area .. All rooms are exterior and overlooking different areas of the Sierra, being able to appreciate the unique beauty of this town and its surroundings. In the vicinity of Pinsapar Park, also recommended the route on the river until you reach the Green Throat, which in rainy seasons it is necessary to request permission and assistance to the Natural Park. The house consists of two floors with three bedrooms, two bathrooms, full kitchen, fireplace, two living rooms and patio garden. The area is of exceptional beauty, it is a natural park and has innumerable possibilities for activities such as hiking, biking, speleology, mountaineering, etc. It is considered as an area of ​​enviable gastronomic wealth, especially for its payoyo cheeses, products of the retinto veal and pork ... Also its wines. In the vicinity there are cities like Ronda, Jerez de la frontera or Cadiz, worth visiting and enjoying each in their specialty. LA TARIFA EXPRESADA SE REFIERE A PRECIOS POR DOS PERSONAS Y NOCHE. EL MINIMO SON DOS NOCHES.LOS NIÑOS TENDRAN TARIFA REDUCIDA,DEPENDIENDO DE SU EDAD.